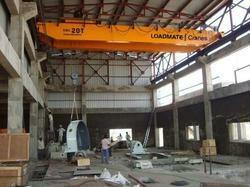 LOADMATE manufactures EOT cranes ranging from 250kg to 200t and above. Our range of EOT cranes includes Single girder EOT, Double girder EOT, Under slung EOT and Light weight cranes. Manufacturer & Exporter of a wide range of products which include Industrial Cranes such as Double Girder E.O.T. Cranes, H.O.T Cranes, Goliath Cranes and Single Girder E.O.T Cranes. We are majorly looking for local queries. For our esteemed clients, we have an advanced range of Double Beam EOT Crane. These Double Beam EOT Crane single and double girder types for use in different areas. Our Double Beam EOT Crane are easy to operate as these have hook approach dimensions and transport functionaries. 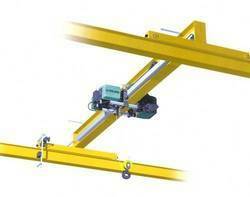 The Double Beam EOT Crane come in compact and bolted designs that make these dimensionally accurate. We can also modify these crane, as per the clients' requirements, by fitting in workshop machinery or equipment like walkways and assembly platforms. The Double Beam EOT Crane offered by us are used for maintenance purposes in powerhouses. Our clients can avail from us Electric Hoist Crane. 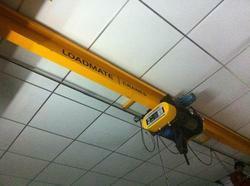 Electric Hoist Crane are capable of lifting loads. With a wide range to choose from, the clients can easily make a choice and go for the one that meets their requirements. The hoist travels on the button flange of beam. These Construction Hoist find application for shifting, loading or unloading materials. 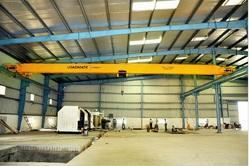 We are one of the leading manufacturers and suppliers of Overhead Travelling Crane. 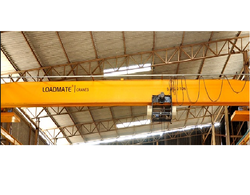 'Loadmate' Overhead Travelling Crane is manufactured using high grade raw materials and components by technical experts as per industrial standards. This customized range of cranes is engineered without any technical error hence is ideal as a material handling equipment in host of industries. An overhead travelling crane, commonly called a bridge crane, is a type of crane found in industrial environments. An overhead crane consists of parallel runways with a traveling bridge spanning the gap. A hoist, the lifting component of a crane, travels along the bridge. We also customize our products as per requirements and demands of our clients. We are one of the most recognized and respected names in the industry to manufacture and sopping of Underhung Crane. We are instrumental in catering to the diversified demands of the customers by bringing forth an array of robustly designed crane. The 'Loadmate' range of Crane range is fitted in various floor areas utilizing several fixing arrangements and modifications in patterns.Proper study and analysis is done which as a result guarantees best design, minimum crane structural weight, wheel loads headroom and clearances which will help in construction reduction cost. 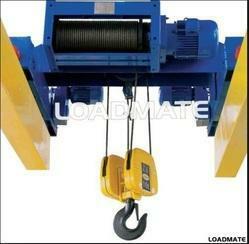 'Loadmate' crane are available in various capacities, sizes, dimensions and specifications. These are in high demand by our clients spread across the globe. We also meet customized requirement for our clients benefit. Our crane serve different purpose in construction sites, warehouses, godowns, transformer stations, general industries, machine and assembly shops. Our Underhung Crane are manufactured as per international standards. We have uniquely positioned ourselves as topmost organization engaged in manufacturing and supplying Steel Mill Duty Crane. 'Loadmate' Steel Mill Duty Cranes are fabricated using premium quality raw material and designed using advanced technology to suit the clients requirements.We provide our Steel Mill Duty Cranes at very low and affordable prices so that our clients can avail maximum benefit from our cranes. Loadmate cranes are provided with great flexibility in allowing the very precise positioning and jerk-free handling of loads for smooth placing and fixing. 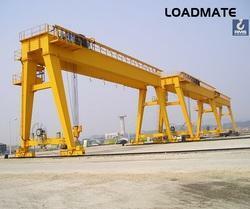 We manufacture Industrial Crane that are widely demanded for various material handling purposes. 'Loadmate' Industrial Crane are well tested on different parameters and are widely appreciated by our clients all across the world for their robust construction, high functionality and dimensional accuracy. Our efficient and lightweight Crane are generally equipped with hooks and chains that help in the proper operation. Our company excels in providing an outstanding range of Flame Proof Crane to our clients from all across the country. These are noted for their excellent construction which provides protection to them from explosion and fire related accidents. These are widely used along with various types of trolleys and are manufactured by using best grade material purchased from our highly reputed market vendors. These Flame Proof Crane are made for applications which comprise of very low head rooms, very high lifts, dual motor speeds and others. We have established ourselves as a renowned manufacturer and supplier of HOT Cranes that is used in lifting heavy goods and transferring goods from one place to another. HOT Crane stands for Hand operated Overhead Traveling Crane, which is employed for transferring heavy weight materials or employees in industrial areas like factory or construction sites. Our HOT Cranes are equipped with the unique design features and are known for their easy operations, durability & low maintenance cost. Our HOT cranes are highly in demand in local as well as overseas market. Our firm is an eminent Industrial Warehouse Crane provider to our patrons. Loadmate specializes in providing total customized solutions for our client’s material handling requirements, helping them choose the perfect Electric Cranes for their requirement. We provide Electric Cranes through all types of overhead cranes and lifting equipments along with service support to make sure our customers are satisfied. For heavy duty applications Loadmate Electric Cranes can supply fully customized double girder EOT cranes as per your requirement for different duty cycles and for a diverse range of application. Customized Electric Cranes such as those with rotating crabs have also been successfully executed by us. Precise and convenient control on up–down motion along with safe traverse motion is achieved by fitting variable frequency drives in the electric panel. Advanced pendant push button station or a radio remote control ensures a smooth and safe operation. 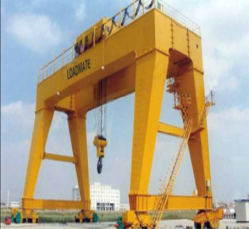 With installations across a wide spectrum including the Automobile industry, Shipbuilding Industry, Power sector including Nuclear power plants numerous small scale industries; Loadmate electric cranes has made a mark. Browse through the options, and do contact us for satisfaction through a perfect lifting solution. With an objective to satisfy our clients in best way we have developed range of superior quality Electric cranes. Our Electric cranes are widely appreciated by clients for their high performance and relatively low price. There is high demand of our products in different foundries, chemical industries, steel industries, machine shops all across India. We also modify our Electric cranes as per the requirements of our clients. We are one of the most recognized and respected names in the industry to manufacture and sopping of Underhung Crane.The 'Loadmate' range of Crane range is fitted in various floor areas utilizing several fixing arrangements and modifications in patterns. Our cranes serve different purpose in construction sites, warehouses, godowns, transformer stations, general industries, machine and assembly shops. Our Under hung Cranes are manufactured as per international standards. These traveling cranes provide an optimal solution where the building solution restricts the normal traveling cranes. In way to satisfy our clients we also modify our products to suit their requirements and demands. Our clients can avail from us Electric Crane. 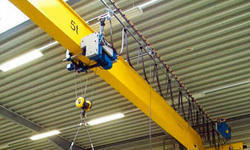 Electric Crane are capable of lifting loads. To make our Electric Crane capable of consuming less energy, these are assembled with high efficiency energy saving motor. A ball bearing ensures smooth running in the drum shaft. The rope drum in our electric crane is made up of sturdy seamless pipers or steel plates. All 'Loadmate' products are extremely rigid in state and offer hassle free performance with excellent results. We ensure that the products fulfill diversified lifting applications of various industries. Horizontal Crane provided by us is able to give excellent performance for long time. Height Of Lift : 8.5 MTR. C.T. motor Kw. : 0.37 kw x 2nos. We are instrumental in offering our clients Gantry crane that are highly used in harbors and warehouses. We are instrumental in offering our clients gantry cranes that are highly used in harbors and warehouses. These cranes are appreciated for their attributes like easy installation, light weight and simple structure. Our Gantry Crane are appreciated for their attributes like easy installation, light weight and simple structure. We offer these cranes in single and double main gantry cranes. These cranes find high applications in handling and conveying equipment in mills, mines, harbors and enterprise stations. 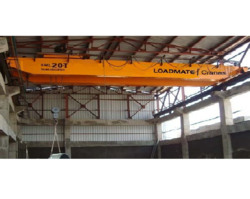 'Loadmate' Gantry Crane is available in various capacities ranging from 1 to 100 tons and are used to lift cartons & machinery in loading areas, warehouses & machine shops. One can use and install our products easily without using any external force. We offer these cranes in single and double main gantry cranes. These cranes find high applications in handling and conveying equipment in mills, mines, harbors and enterprise stations. We manufacture Industrial Cranes that are widely demanded for various material handling purposes. 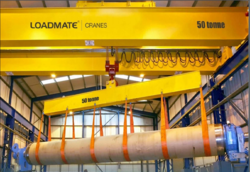 'Loadmate' Industrial Cranes are well tested on different parameters and are widely appreciated by our clients all across the world for their robust construction, high functionality and dimensional accuracy. Our efficient and lightweight Cranes are generally equipped with hooks and chains that help in the proper operation. Supported by our industrious professionals we are involved in production of Industrial Overhead Crane to our consumers. It is widely used industrial product and is based on latest technology. It consists of parallel runways and is admired for its flawlessness and ease of operation. This product is best suited for industrial environments and gives exceptional performance for long time period. Experts have adopted latest technological innovations and quality approved material for producing the entire range as per the clients requirements. We are the leading manufacturer and supplier of Flame Proof Cranes. Our Flame Proof Cranes have been constructed in such a way that there is no risk of an explosion. 'Loadmate' Cranes are also structured with different types of cross travel trolleys like power travel type, hand geared travel, push pull trolley and flexible trolley. Very high quality raw materials are used for manufacturing of our cranes. All the materials go through series of tests and inspections. We also specialize in supply of custom built flame proof wire rope hoists for special applications like very low head rooms, very high lifts, dual motor speeds or any other specific application. 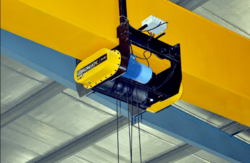 We manufacture and supply a quality range of Overhead Cranes. Overhead cranes, engineered using high quality raw materials, are preferred for our high tensile strength and longer durability. They are anti corrosive in nature and convenient to operate. Our sturdy industrial equipment offer smooth and flawless functioning. 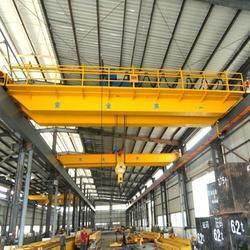 We are one of the leading manufacturers and suppliers of Overhead Cranes. 'Loadmate' Overhead Crane is manufactured using high grade raw materials and components by technical experts as per industrial standards. This customized range of cranes is engineered without any technical error hence is ideal as a material handling equipment in host of industries. An overhead crane, commonly called a bridge crane, is a type of crane found in industrial environments. An overhead crane consists of parallel runways with a traveling bridge spanning the gap. A hoist, the lifting component of a crane, travels along the bridge. We also customize our products as per requirements and demands of our clients. Our company excels in providing an outstanding range of Wire Rope Hoist Cranes to our clients from all across the country. These are noted for their excellent construction which provides protection to them from explosion and fire related accidents. These are widely used along with various types of trolleys and are manufactured by using best grade material purchased from our highly reputed market vendors. These Flame Proof Crane are made for applications which comprise of very low head rooms, very high lifts, dual motor speeds and others.